Great stop, walk to restaurants, hardware store and real estate offices. The Belhaven Water Street Bed and Breakfast is a block down the street. 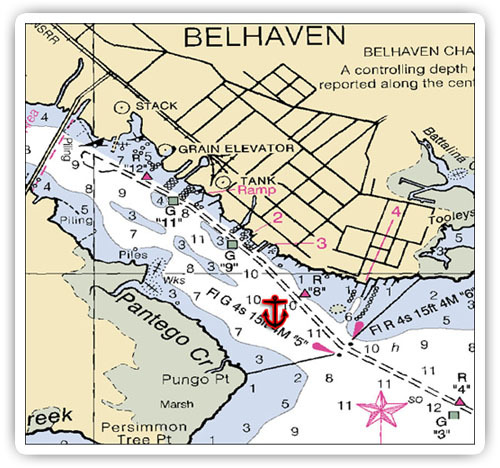 Belhaven anchorage is much the same today as it was when we first read about it in your “Cruising Guide to Coastal North Carolina” – plenty of room to anchor in 10 ft but still having a couple of shallow places near G11. You can still anchor beyond the daymark, which is within rowing distance to the National Wildlife provided boat ramp, where we left our dinghys. Additional dockage for dinghies is provided by the city at mid-town, but it’s a higher step up to land. I’ve heard it said that Belhaven is not good anchoring because of the soft mud but in the several times I have anchored here there’s been no trouble in up to 20 knots of wind. River Forest Marina still has diesel, water and pump out and charges $1.50 per foot for dockage. At a separate location River Forest also has a full service yard with an excellent mechanic. We ate out at the one restaurant we could find, Fishhooks, where we had cocktails and and excellent meal at very reasonable prices. An Ace Hardware is in the middle of town and has it’s own library (of all things) with very inexpensive used books for sale on an amazingly wide variety of subjects. We prefer to anchor further in, just south of the charted end of the channel short of the bridge (right about the 9 foot sounding). Much better protection, good holding and ample swinging room. The town dinghy dock is also more convenient from this location. You must mind the channel coming in as those shoals are very much there, and of course it is a longer trip out to the ICW.